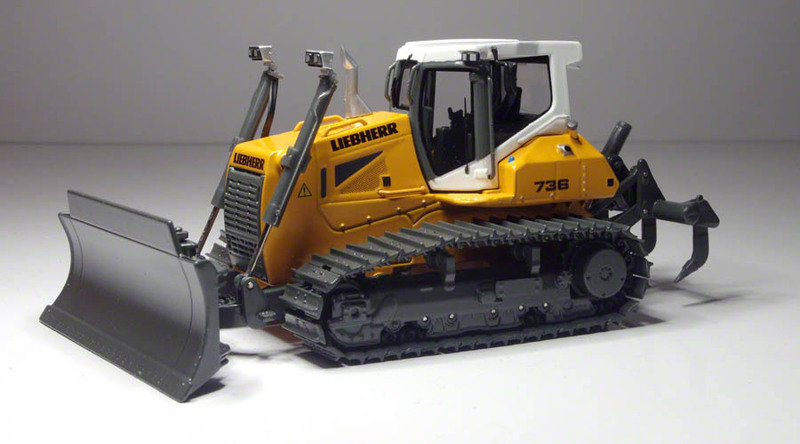 The scale model of the Liebherr PR736 LGP is made by NZG. 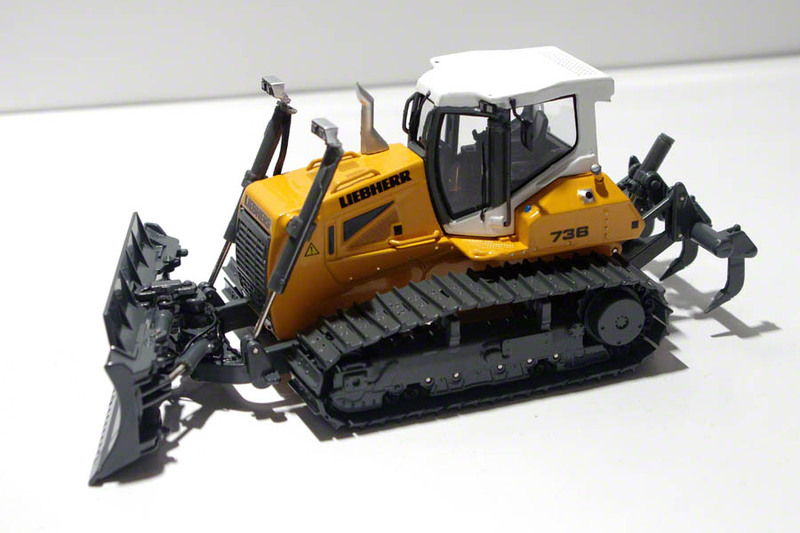 With an operating weight between 20 and 25 tons the PR736 sits in the middle of the Liebherr bulldozer lineup. The model comes in a cardboard box and is enclosed in two styrene trays. There is no assembly needed. 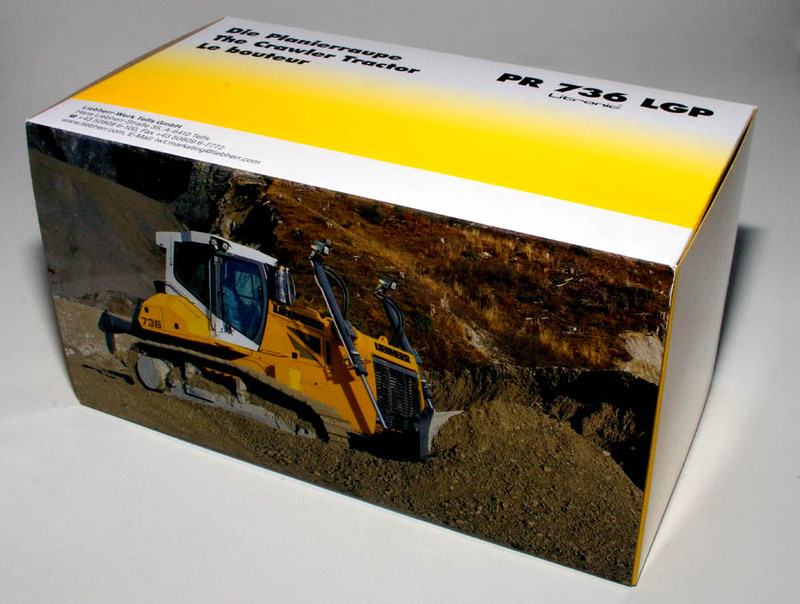 The PR736 is available in three variants, L, XL and LGP. Apart from the LGP version reviewed here, a scale model is also available in the XL version, featuring a semi-U blade on an outside mounted push frame, whereas this LGP version has an inside mounted push frame. The model is equipped with a 6-way blade. The blade has non functional hinged corners cast in for reduced transport width. All cilinders have flexible hydraulic hoses attached. The blade has a realistic range of movement in all directions. 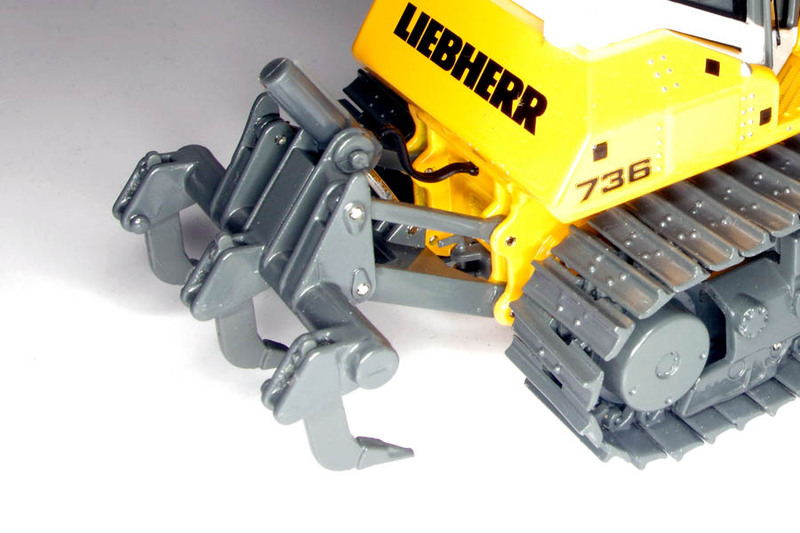 At the rear, the model features a 3-shank ripper. The ripper has a good range of movement, with the shanks being individual but fixed parts. Behind the ripper is an non functional towing hook. 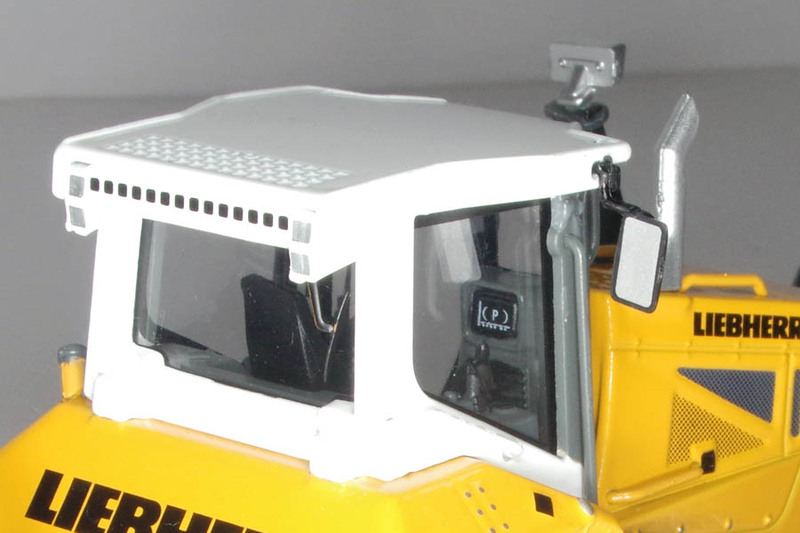 The cab exterior is detailed with mirrors, working lights and photo etched windscreen wipers on the front and rear windows and doors. The cab windows are slightly tinted. 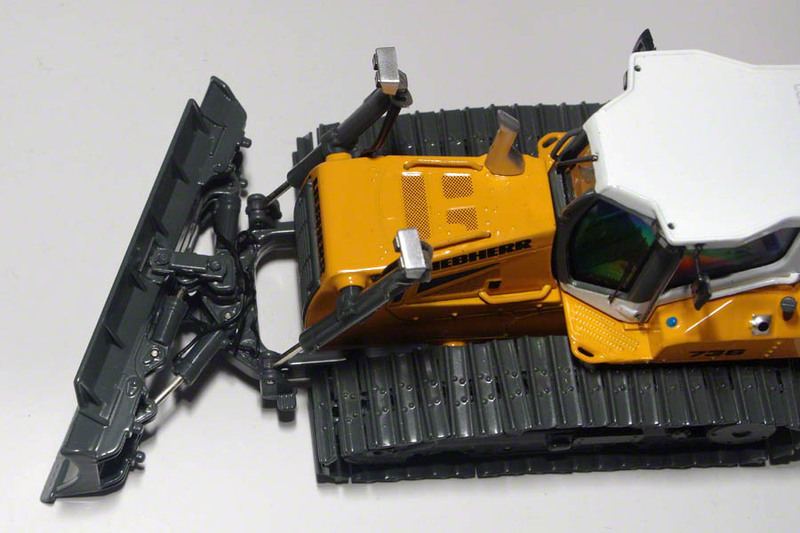 The casting surrounding the cab features painted fuel cap and highlighted bolts. The interior of the cab is grey with the drivers seat and control levers detailed in black. The dashboard has a sharp printed display. On the outside the model has painted grills and warning labels on the sides and on top. The main cilinders have dual working lights on top. The grille on the front is a separate plastic piece with sharp detailing. The crawlers consist of nivcely detailed individually linked metal pads. Most, but not all, track rollers are functioning, the carrier rollers are glued in placce and thus don't function. 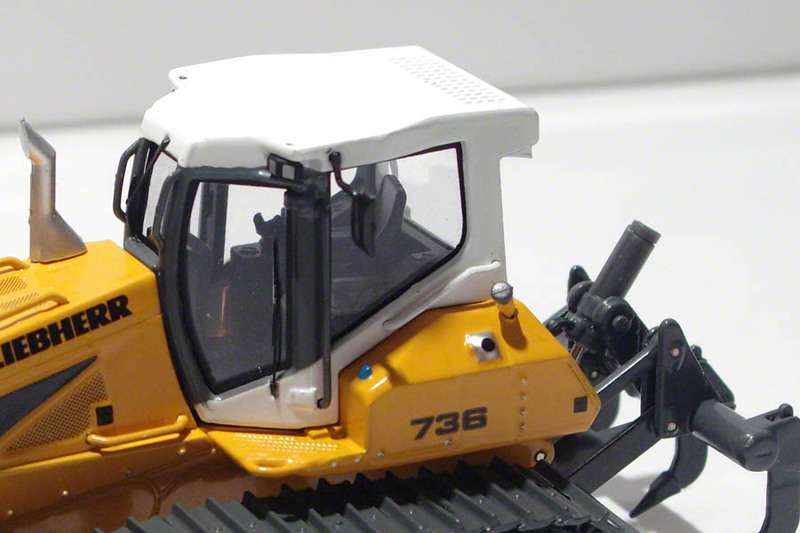 The PR736 LGP is a highly detailed model by NZG. It captures the fresh rounded design of the real machine very well. All details and the sharp printing together give the model a very realistic appearance.